Draw point grid 10 x 10 x 10 cm. This dimension is for 3d printing. “Gumball extrude”: select with STRG/Shift surface and extrude with gumball. Move or extrude surfaces further after created an object. Extrude with gumball paralell to axis. 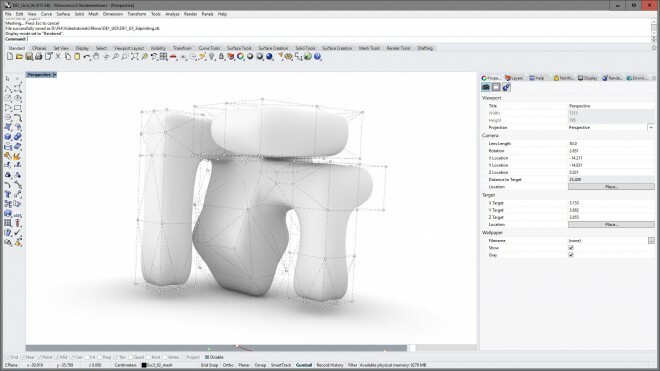 Reorganize layer structure for excercise 3 and correct mistakes: duplicate layer and objects. Boolean operation Union: union all objects to one object. Boolean operation Difference: substract objects from each other. CMD “mesh”: Convert polygon to mesh to be able to use the object for subdivision. Subdivision CMD “SubDFromMesh”: create organic freeform object See problems with touching, but not intersecting areas. Subdivision with none unioned single objects (several single objects). Select with selection menue. Export mesh (!) object for 3d printing as .STL file.